Bible Explorer is a fully-functional Bible study software program for those who preach, teach, and love to study God's Word every day. 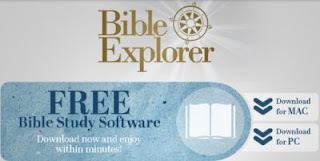 Bible Explorer is produced by WORDsearch Bible Software and is available free of charge to everyone. It includes access to over 200 Bibles, commentaries, dictionaries, devotionals and other reference volumes. You'll be amazed at its simple, yet powerful functions for searching and cross-referencing the scriptures.